Look Up! The New Venus moves across the Sun. Venus begins an eight-year drawing of a five-pointed star! The Moon guides us on Goodwill journey. Mars and Saturn trade places. Jupiter dances with a Lion, a Moon and two nearby comets! Mercury is missing. 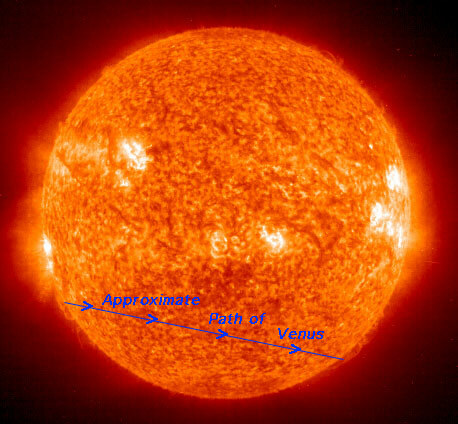 The above image shows the approximate path of Venus across the Sun. 2004 and 2012 Venus Transits shows the exact path. Note: Transits of Mercury, which occur in May or November, are more common. The first of 14 transits of Mercury to take place during the 21st century was observed in May 2003. Mercury transits are difficult to notice because the planet is so small and far away. Venus transits are easier to observe because the planet is closer to Earth and appears as a larger "dot" crossing the Sun. Planetary Transits Across the Sun gives the dates of Venus and Mercury transits. BTW: Venus rotates very slowly—in 243 days compared to the Earths 24 hours; the transit pattern of Venus as noted above is a 243 year cycle. Venus spins clockwise like Uranus and Pluto; Mercury, Mars, Saturn, Jupiter and Earth spin counterclockwise. The above chart came from a very lengthy and very informative article, Venus Transits and Powerful Women; it explores the concerns of Venus including the lighter and darker sides; it cites historical events that occurred during these transits and lists things you can consciously do to prepare for a Venus transit. This ancient prophesy says that the new world of consciousness will be born on the occasion of the Venus Passage June 5/6, 2012. A number of countries are now encouraging yearly global meditations on June 6 to prepare for the 2012 Venus transit. This yearly build-up of global energy is a global commitment intended to anchor on Earth the acknowledgement of our Oneness, the transcendence of all national, religious, ethnical, political and racial differences and the co-creation of our One World. The June 8, 2004 transit, when the light of the Sun sends the love, beauty and creativity of Venus to the Earth, marks the first of these meditations. Prepare for this passage and unified global meditation with the following links. emergence of a newly evolved humanity. Venus Creates a Five-Pointed star! the psychophysiology of Venus in our lives, and much more! at the time of the June 8 transit. across approximately three-quarters of our planet! The limb of Venus is externally tangent with the Sun (ingress). tangent with the Sun (ingress ends). and the planet vanishes from sight. inspired by the 1882 transit of Venus! Venus drops rapidly toward the horizon in Gemini. Mid-May this blazing "evening star" is just 28 degrees** above the horizon, setting at 10:15pm, by Mays end a mere 10 degrees**, setting at 9:30pm and by June 2 she vanishes from the night sky in a solar embrace. Her rare and dramatic dance across the Sun occurs on June 8. Venus telescopic appearance changes dramatically during this time as well. The planets phase shrinks as its disk size grows. 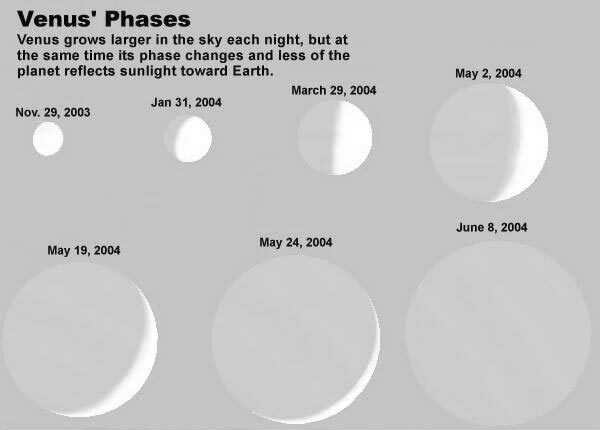 Venus Has Phases ... Like the Moon helps you understand why this occurs. Note: Like a New Moon, the New Venus occurs on June 8, with its transit across the Sun. One cannot see a New Moon because it is in close alignment with the Sun and is hidden in its light. This cycles invisible New Moon occurs on May 18, 9:52pm PDT. To see it on May 19 would require exceptionally good circumstances and eyesight. If it could be seen, it would be found close to Aldebaran, the star of illumination and enlightenment. May 20, the first day of Gemini, the baby Crescent Moon should be considerably easier to see. This sliver of a Moon, which sets just after 10:00pm, lies below Venus and Elnath creating a beautiful triangle. This evening is significant. It is the night of Ascension Day , commemorating the return of Jesus Christ to heaven. The Ascension prepares the way for the Holy Spirit to come at Pentecost, ten days later, the day of the apostles empowerment. This visible "New" Moon alignment is auspicious and readies us for this cycles Full Moon spiritual empowerment and service in the world. Create a sacred space and align anew. What is conceived at this time occurs deep within our being. A potential is enlivened and the seed of a new awareness is formed. Look Up! Four Planets, the Moon and a Comet! May 21 the Moon climbs between Venus and the Mars-Saturn pair. Now is the time for disciplined energy. Can you create a partnership between the feminine and masculine energies in your life, one that brings out the Divine in each? Empower with wise love. Your success at this task helps the goodwill of humanity manifest on Earth. May 22 Mars and Saturn move next to each other and the waxing Crescent Moon is a focal point between this pair to the west and Castor and Pollux to the east. Watch how these two Moon triangles change shape in just a few hours. Mars and Saturn can produce a feeling of inhibited energy, intense irritability and cold crude anger. Keep things simple, force nothing, breathe deep, relax and tame your warring nature. This lunar phase gives rise to obstacles from the past, which impede the new, growing awareness. Esoterically, Pollux represents the Soul and Castor the personality. Whats in the way of this union? It would be helpful at this time to become familiar with the uniting Principle of Essential Divinity. Note: Pollux and Castor are regarded as the patrons of seafarers, and the protectors of all at sea. The expression, "By Jimminy!" is a popular corruption of the swearing of the ancients by these patrons, as in "by Gemini." They know the secret of working together for the benefit of many. They know how to work with the watery (emotional) nature. Look Up and invoke the healing qualities of the Gemini Twins. May 23 the Moon moves above the Gemini Twins. The challenge continues to be overcoming duality. NEAT Lines-up with Leo and Jupiter ~ Wheres Comet LINEAR? Look for a possible appearance from Comet LINEAR low in the southwest ... see lower left of the image for the blue streak. May 24 Mars conjuncts Saturn at 4:00pm PDT. (Review the Mars and Saturn insights from May22.) In the evening find the growing Moon near the Beehive/Manger star cluster (M44) in Cancer. The Moon can be seen between two bright stars, Regulus to the east and Pollux to the west, and between brilliant Jupiter the Saturn-Mars duo. Take some time to retreat and build a lighted house and therein dwell. Ponder upon your manger and your virgin birth of the Christ consciousness. Ponder upon the beehive, unity in the midst of diversity, and the part you play in group work. Saturn and Mars are found just after sunset in the west-northwest sky in the constellation Gemini during the sign of Gemini. They do an elegant dance trading places in May, with Mars moving above Saturn on May 23. The two planets are in conjunction on May 24. Both are slipping down towards the horizon. During the first week of June Saturn is only 10 degrees** above the horizon about an hour after sunset. Mars lies about 4 degrees** above Saturn and is five times fainter. You may want binoculars to spot the dim Red Planet. ... to see Saturn before it is swallowed up by the Suns glow. Mars remains in view as it appears to pull away from Saturn, which is dropping faster. Saturn sets in the beginning of Gemini at 11:11pm; Mars at 11:15pm. By its end Saturn sets at 10:00pm; Mars at 10:45pm. June 17 a brand new lunar cycle begins with the New Moon hidden in the embrace of the Suns light. The Moon returns to the evening sky as a thin crescent on June 19, when it forms a striking line just above the western horizon with Mars and the Gemini Twins. They line up from left to right ... Mars, Moon, Pollux and Castor. Create a sacred space to bring in the new cycle of energies. Tame your warring nature and wield power with wise love creating unity. to NASAs Cassini spacecraft our view of Saturn is not lost. June 11, 2004 Cassini approaches Saturn and visits Phoebe. mission updates of NASAs twin Martian rovers. Mars, Saturn, Jupiter; the Moon lies to the left. Jupiter shines overhead, high in the southwest at twilight. Youll be dazzled by its growing brilliance as the sky darkens. During Gemini watch this gorgeous gaseous planet move away from Regulus, the heart star of Leo the Lion, and move toward Denebola, the Lions tail star. The energies of Jupiter and Leo are about stimulating Higher Law, awakening right understanding and producing the greatest good. Jupiters visit with the Cosmic Lion lasts for about another four months. Jupiter sets in the beginning of Gemini at 2:22am and by its end at 1:00am. Look Up to Leo the Lion and Jupiter; open to the energies that help create a soul infused personality. ... for great telescopic and binocular views of Jupiter. Can you see its four large bright moons, known as the Galilean satellites? Watch them change positions from hour to hour and night to night. 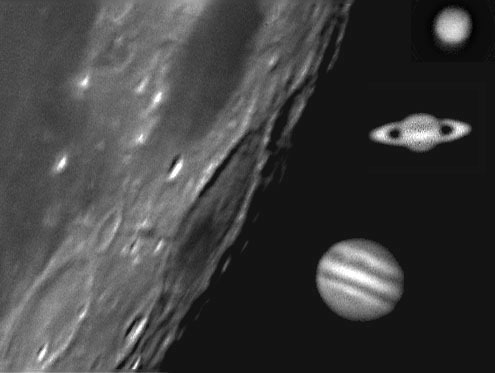 If you have a new browser, you can view Jupiters Moons from different telescope types. Here's a Jupiter Observing Guide and the Transit Times of Jupiter's Great Red Spot. The growing Crescent Moon visits Leo the Lion. May 25 the Moon enters the constellation Leo and lies northwest of Regulus, the Lions heart. BTW: Comet NEAT is just to the right of the Moon and fades quickly after this night. May 26 the "almost" First Quarter Moon slides between Regulus and Jupiter and on May 27 the "just" Quarter Moon moves east of Jupiter to the Lions hindquarters near the star, Denebola. Mark your calendars; the Moon and Jupiter is always a special visual treat. This lunar phase signals a balance between the light and dark moving toward the light. Ideally obstacles impeding the growing new awareness are overcome now in order that the Full Moon energy can be utilized. Note: May 25 Comet NEAT is just to the right of the Moon. On May 27 Comet NEAT stands about 40 degrees** to the North (right) of the Moon; while Comet LINEAR is almost directly below the Moon, near the horizon in the early evening. (See Celestial Delights below for more on LINEAR) A Tale of Two Comets is Astronomy.coms complete guide for observing Comets NEAT and LINEAR. Regulus is the Lion-Hearted Lawgiver who can guide humanity in expressing the love-wisdom of the Christ consciousness—the requirements of which are to love all of humanity, lead a disciplined life, recognize the divinity in all faiths and all beings, and rule your daily life with Love. It is said that Jupiter transmits cosmic forces into our solar system. Bailey EXH pg. 155 Jupiter bridges energies by bringing out the best in all. Jupiter is the benevolent one and symbol of expansion, higher mind and wisdom. Leo's highest expression is the fully integrated personality who stands out from the "herd" and is ignited by the fire of Divine Will. The one who masters Leo's energies can begin the group work of the Soul. If you haven't aligned with Leo's higher law as the Moon moves through this constellation, Denebola, the Lion's tail star also known as the Changer, may bring about swift judgment as it joins with the Moon. The waxing Gibbous Moon, which is more than half lit moving toward the light, dances with Spica and Arcturus. Illumination and growth are offered during this Moon phase, only if the obstacles from the past are cleared away. Spica is the brightest star in the constellation Virgo. Virgo the Virgin has been associated with the Holy Grail and with the birth of the Christ consciousness within human form. Arcturus is the herder of the Divine Will emanating from the 7 stars of the Big Dipper in the constellation Ursa Major , and is the bridge between these 7 stars and Virgo the Virgin. (see above sky chart) Look Up as the Moon moves through this area, lift your thoughts, raise your energies and align with these great heavenly bodies. The "missing claws" of Scorpius become Libra, the razor edged path, a point of balance where neither spirit nor matter dominates. Libra demands justice and the perfect point of eqiibrium. May 31 the Goodwill Moon dances in the constellaion Libra. Choose the Way which leads between the two great lines of force! June 1 the "fulling" Moon approaches the burning ground of Scorpio. Prepare to be transformed as the Full Moon approaches. Mercury is lost in the glowing embrace of the Sun during Gemini. Is it a planet? ... What planet? When you look up at the night sky, how do you know you are looking at a planet? Click here. *2 degrees is hardly more than a fingers breadth at arms length. **10 degrees is one width of your fist at arms length. Look Up! Comet LINEAR does a flyby. Goodwill and a BIG HEART make all things new! The comet will peek into the evening sky in late May. 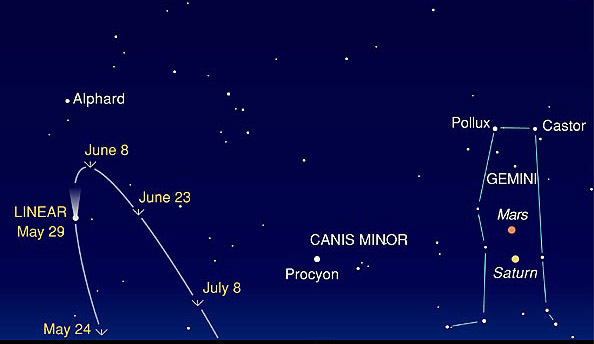 Look for it beginning the last few days of May, standing well to the left of the bright star Procyon in the west. Early predictions said the comet might grow almost as bright as Procyon. Like NEAT, however, it has not performed as anticipated, so it should remain a good bit fainter than the star. LINEAR will stand highest in the sky around June 8. Look for it just below Alphard, the star that marks the "heart" of Hydra, the water snake. The comet should be fainter than the star, with a short tail extending to the upper left. Binoculars will greatly enhance the view. LINEAR will fade quickly during June, and disappear in the glow of twilight before month's end. What are comets? ~ Where do they come from? The Festival of Goodwill, which occurs at the time of the Full Moon on Wednesday, June 2, 2004 at 9:20pm PDT; 04:20 UT June 3, inaugurates the third of the Three Major Planetary Festivals. The energies released at the Goodwill Festival are forces of the Divine Will that affect the nations of the world. These reconstructive energies can increase the aspect of national life or they can increase the potency of the objectives of world unity, peace and progress. With the keynotes of goodwill and "humanity, aspiring to God," this festival is also observed as the Festival of the Spirit of Humanity, and as World Invocation Day. At 8:30pm in the mid-northern latitudes begin looking southeast for the rising Goodwill Full Moon. The front end of the constellation Scorpius and its red heart star, Antares, precede the Moon over horizon. At 9:20pm the Full Moon occurs and by 10:45pm the sprawling "J" shape of the Cosmic Scorpion fully rises and can be seen in the southeast. The teapot shape of the constellation Sagittarius follows. the Heart of our Galaxy and Pluto! Each Goodwill Festival Sagittarius, a centaur archer, points his arrow at both Antares, the red heart star of Scorpius, and also at the Goodwill Full Moon at the center of our Milky Way Galaxy, the family of 200 billion stars to which we and our Sun belong. The Milky Way is widest in Sagittarius and Scorpius because the great bulging central hub, the heart of our galaxy, is in this direction. Sagittarius sees the Vision and knows the Way to go. Antares, associated with awesome power that can be hideous or sublime, wields the Fire of God and gets your kundalini running! Scorpius influences a turning point in the life of humanity and in the life of the individual human being. It reorients the personality to the life of the Soul and later to initiation and sensitivity to the Divine Plan. Scorpius is the burning ground and is synonymous with transformation. Telescopic Pluto adds its energy to the Full Moon mix. The message of Pluto is to change or be changed! Will you resist, accept, resign yourself to or affirm the needed change and transformation of this Full Moon Festival? If you thought the Wesak Full Moon was HUGE, at 223, 500 miles away, this Goodwill Full Moon is even BIGGER! This Full Moon is the biggest and closest one for 2004! It is only 222,000 miles from the Earth and appears 13% larger than the average Moon. This Moon is over 30,000 miles closer than the furthest Full Moon of 2004, which is just over 252,000 miles away, on December 26. Note: Each month when the Moon is at perigee it is about 225,000 miles away and when it is at apogee it is about 252,000 away. At the New Moon a potential is enlivened deep within, when our soul goes into meditation and aligns with the inspiration of the Nirmanakayas. As the Moon grows in the light provided by our Sun, we too grow in the light of our Soul. Since this Moon is REALLY BIG and reflecting a lot more of the Suns light, I would expect that we have a greater opportunity to grow in the light of our Soul! The galactic center, heart of the galaxy, and its polar opposite (anti-glactic center) near Elnath and Aldebaran play a stimulating role during this cycle with their mirroring and interplay of energies. May 17, one day before the New Moon, Venus is stationary retrograde opposite the heart of our galaxy. May 19 , one day after the New Moon, there is an invisible Aldebaran/Moon conjunction opposite the star Antares, which lies near the heart of our galaxy. May 20, the first day of Gemini, the Goodwill baby Moon forms a triangle with Elnath and Venus at the anti-galactic center. The Goodwill Full Moon conjuncts Antares near the galactic center. Open to the cosmic evolutionary energies that are now blessing and evolving our solar system. June 2 Look Up! View the Goodwill Full Moon, which lies at the heart of our galaxy! Humanity now has an exceptional opportunity to receive the cosmic outpouring of energies that activate our individual, national and global Will-to-Good. In meditation join with others on the inner planes to form and affirm a united spiritual channel that can receive and use these forces of Divine Will to make all things new, in service to the One Life that unites us all. Note: Venus disappears in the glowing embrace of the Sun today. June 3–4 The Moon moves through the constellation Sagittarius. During this time use the one pointed focus of the Archer to see the Vision and know the Way to go. As part of the Full Moon's united spiritual channel, use this window of opportunity to direct the cosmic forces of Divine Will toward healing the nations of the world. June 5–7 The waning Gibbous Moon leaves Sagittarius, enters the constellation Capricorn and approaches telescopic Neptune. During this phase of the Moon open to the illuminating influences of the entire Goodwill lunar cycle. This movement and positioning of the Moon turns your awareness toward the material world, work and service. This is an excellent time to increase your sensitivity to the world around you and be an example of goodwill on planet Earth. June 8 The New Venus crosses the face of the Sun today in a rare Venus Transit. (See Planetary Treats above.) The waning Goodwill Moon, an "almost" Last Quarter Moon, rises at 1:08am PDT and Venus passes closest to the Sun's center at 1:19:44am PDT! This Moon lies in the constellation of Aquarius near telescopic Uranus with Fomalhaut to the southwest and Enif to the northwest. This phase of the Moon can bring a crisis in consciousness. The experiences of the Goodwill Full Moon have culminated and one must now prepare for rebirth. The old must be destroyed before the new can come. Uranus helps by overthrowing established attitudes that have outlived their usefulness. Uranus makes us let go. It shakes us loose. Fomalhaut has been associated with the Archangel Gabriel whose trumpet sounds to announce the birth of Christ and the Judgment Day. Enif warns of danger in battle. Prepare to rid yourself of that which stands in the way of an expanded heart. Note: The Last Quarter Moon occurs on June 9 at 1:02pm PDT; 20:02 UT. BTW: Comet LINEAR stands hightest in the sky now. a slivery thin waxing crescent. Amazing! This is a time for conscious growth as the Moon dissipates its collected solar potential and a New Venus is born. Rebirth can occur. A new lunar phase begins June 17. Mercury is hidden in the glowing embrace of the Sun. Venus, our blazing evening "star," sets mid-May at 10:15pm and by the end of May at 9:30pm. She disappears in the setting Sun's light by June 2 and then makes a rare transit across the Sun on June 8. By June 15 this beauty of a planet appears in the predawn sky. Venus is retrograde until June 29. Mars and Saturn are found just after sunset in the west-northwest sky in the constellation Gemini. They trade places on May 23 as Mars moves above Saturn and are conjunct on May 24. Mars continues to fade in brightness. June is the last chance to see Saturn in the evening sky. Saturn sets in the beginning of Gemini at 11:11pm; Mars at 11:15pm. By its end Saturn sets at 10:00pm; Mars at 10:45pm. Jupiter is a brilliant beacon of light high overhead in the southwest at sunset. Jupiter moves east toward the Cosmic Lions hindquarters and sets in the beginning of Gemini at 2:22am and by its end at 1:00am. June is the last month for great telescopic and binocular views of this planet. The Big Dipper can be seen to the north of Leo the Lion and Jupiter. Spring Star Chart Travel to 6 stellar destinations in 5 constellations with Big Dipper Navigation. Scorpius the cosmic scorpion, a sprawling "j" shaped constellation, is seen in the southeast at sunset. It's a summer constellation that's on the rise! The Summer Triangle is also on the rise! Begin Looking for this stellar right triangle high in the northeast at sunset. Vega is the brightest star and western point, Deneb the dimmest star and eastern point, Aquila is the southern point. May 19 If Moon can be seen, it is near Aldebaran. May 20 First day of Gemini. Venus, a thin Crescent Moon and Elnath form a beautiful triangle on western horizon just after sunset. May 21 Daylight Venus is very close to the western limb of the Moon about 25 degrees** to the east of the Sun. The Moon occults Venus for observers in Europe except those in far northern Scandinavia, NW Africa, Central Russia and W Asia at 12:00 UT; 5:00am PDT. A thin crescent Moon lies between Venus below and the Mars-Saturn pair above. Look west just after sunset. Can you see Elnath? Mars lies below Saturn today. Come Neat lies above Pollux. May 22 Mars is next to Saturn today. A waxing Crescent Moon is a focal point between this pair to the west and Castor and Pollux to the east. Watch these two triangles change shape. May 23 The Moon moves above the Gemini Twins. How many planets and stars can you identify? Comet LINEAR may appear low in the southwest in the early evening. May 24 Mars conjuncts Saturn at 4:00pm PDT. Moon lies near the Beehive between Regulus and Jupiter in the east and the Saturn-Mars duo in the west. Look for Comet LINEAR low in the southwest in the early evening. May 25–27 Moon moves through Leo the Lion. May 25 Moon lies northwest of Regulus. Comet NEAT is just to the right of the Moon. Comet LINEAR is low in the southwest in the early evening. May 26 The "almost" First Quarter Moon slides between Regulus and Jupiter. The Moon moves east of Jupiter to the Lions hindquarters near the star, Denebola. Comet NEAT stands about 40 degrees to the North (right) of the Moon. Comet LINEAR is almost directly below the Moon, near the horizon in the early evening. The waxing Gibbous Moon dances with Arcturus and Spica. The Moon is in the constellation Libra. June 1 The "fulling" Moon approaches the burning ground of Scorpio. June 3–4 The Moon moves through the constellation Sagitarius. June 5–7 The waning Gibbous Moon enters the constellation Capricorn and approaches telescopic Neptune. Fomalhaut lies to the southwest and Enif to the northwest of the Moon. Comet LINEAR stands highest in the sky. June 15 Venus rises about 5:10am and is visible low on the eastern horizon below the very thin waning Crescent Moon. June 16 Venus rises with a slivery thin waning Crescent Moon around 5:05am. Telescopic Venus is a "New" waxing Crescent Venus. Click here for NASA's solar weather report and more!